At 4:30 p.m. on Sunday, Nov. 19, Music Director Carlos Izcaray conducts the American Youth Symphony in a live performance of John Williams' Oscar, Grammy, and Golden Globe-winning score for E.T. The Extra-Terrestrial with a full screening of the classic, coming-of-age sci-fi adventure. 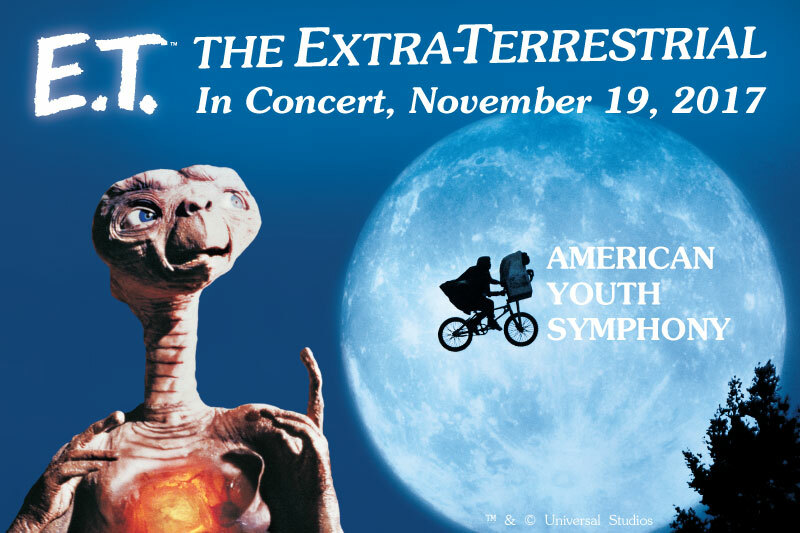 LOS ANGELES, October 9, 2017	(Newswire.com) - ​On Sunday, Nov. 19 at 4:30 p.m. in UCLA’s Royce Hall, the American Youth Symphony (AYS) performs live-to-picture John Williams’ film score for Steven Spielberg’s E.T. The Extra-Terrestrial. Preceding the concert will be a Q&A at 4:00 p.m. featuring film music luminaries David Newman, Ralph Grierson and Katie Kirkpatrick, moderated by Jon Burlingame. An E.T.-themed benefit dinner follows the concert, honoring AYS Board Members David Newman and Steven Linder, pioneers of the live-to-film concert movement. Concert and Q&A tickets are just $15, with all-inclusive dinner packages starting at $350. Reserve your tickets today! Started by Newman and Linder in 2008, the Hollywood Project has brought to the concert stage scores by Danny Elfman, Jerry Goldsmith, Michael Giacchino, and Alan Silvestri, and in its celebratory tenth year, will feature a score by the greatest legend in the history of film music, John Williams, whose magnificent score for E.T. The Extra-Terrestrial won the Oscar, Golden Globe and Grammy awards for best original score in 1982. The Hollywood Project has been widely praised as showcasing the technical prowess and musical maturity of the AYS orchestra, with Justin Craig of Film Score Monthly writing: “The American Youth Symphony stands high, mastering the challenge of performing film music with all its unconventional meters and rhythms. Don’t be deceived by the label of ‘youth’ orchestra; AYS is the real deal.” The project is made possible by the support of the Los Angeles County Arts Commission, BMI, and AYS donors and sponsors. E.T. the Extra-Terrestrial in Concert is a production of Film Concerts Live!, a joint venture of IMG Artists and The Gorfaine/Schwartz Agency, celebrating its fifth year of bringing iconic and beloved movies to renowned symphony orchestras and concert halls around the world. Other titles produced by FCL include Raiders of the Lost Ark, Jaws, Jurassic Park, Back to the Future, Home Alone, the last three Star Trek films, The Artist, The Addams Family and Casino Royale. The concert will be led by AYS Music Director, Maestro Carlos Izcaray, who brings a wealth of experience and expertise to the stage. Born to a family of multi-generational musical talent, Izcaray has been a devotee of classical music since he started in Venezuela’s public system of youth orchestras at the age of three. In addition to working with a diverse array of professional and educational ensembles all over the world, he has also earned accolades for his performances as both a soloist and chamber musician. The American Youth Symphony’s mission is to inspire the future of classical music by providing landmark fellowships to virtuosic young adults and innovative free and low-cost concerts to the Los Angeles community. A diverse group of over 100 exceptionally talented musicians in high school through doctoral music programs, AYS members receive invaluable training from world-class conductors and seasoned mentors, as well as generous financial support and unique opportunities to perform in front of large, enthusiastic audiences across all backgrounds.